Photos from our recent trip in Northern Ontario are here on Flickr. I'll also update the original post. Our Ontario trip was a mixed bag of ups and downs, but mostly ups. Everything is pretty good with some not-so-good mixed in. Traveling with Diego. We loved it! It was so much fun having us with him all the time, and seeing him so happy and content. Downside: Traveling with a dog can be a bit limiting. We had planned to leave him alone while we explored Sudbury and Thunder Bay, but when we were actually there, we weren't comfortable with it. We had very limited time in those towns anyway; had we been there for more time, we probably would have done it. Balance: A huge 5 out of 5 leafs. The RV. I love traveling by RV. On a road trip, it's great to be so self-contained, to not have to go out for every breakfast and dinner, to have your own kitchenette and washroom, but still be in the woods. 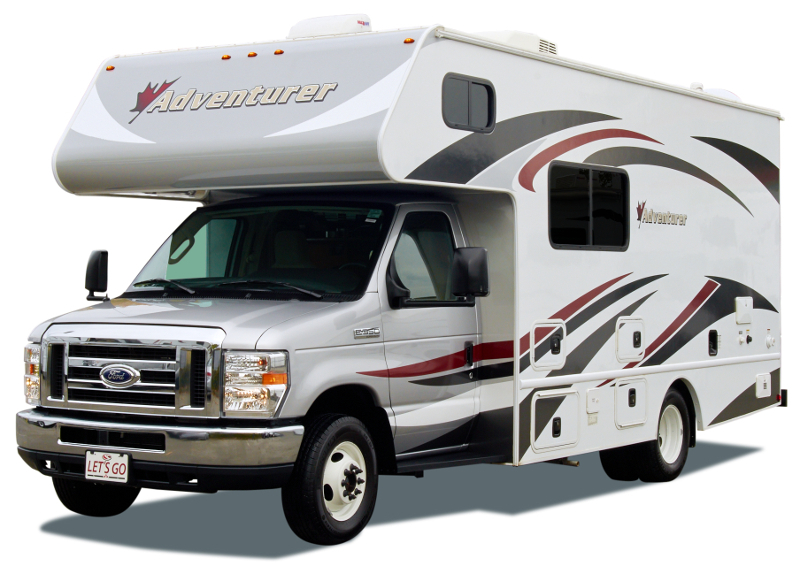 Ever since we traveled by RV in Alaska, about a million years ago (1996), I've dreamed of owning one. That's not very practical, but I hope we can rent one again soon. Downside: Once you're in a campsite, it's not easy to explore a town or city. The ideal would be an motorhome towing a small car, or a big car towing a trailer. That gives you the convenience of the RV and the flexibility of leaving it behind. With only the RV, it can be a bit limiting at times. Balance: 4 out of 5 maple leafs. 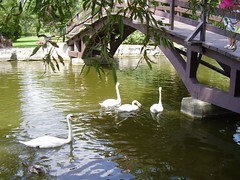 Park facilities. The provincial parks were beautiful. The campsites were good, each with a firepit and picnic table, and some with electric hookups. The washrooms and showers were clean, and there was a washer/dryer available in every park. Downside: Ontario Parks doesn't take reservations in September (with one exception: Killarney... but we were given wrong information, so we didn't know that). Without reservations, we would get in to a park, often late in the day, then have to drive around looking for a suitable campsite. This was tiring, especially after a whole day of driving. Not being able to reserve campsites was a significant drawback. I assume the absence of reservations is a cost-cutting measure. It's not good. Park facilities were five-leaf, but the absence of reservations was a real drag. Road-tripping through Ontario provincial parks. Ontario is insanely huge. The area we drove through is beautiful, but it's a lot of driving, even if you love road trips as much as I do. The parks have a certain sameness to them -- especially if you're not up for extremely challenging hiking or climbing. The Ontario Parks trail rating scale was very different than what we're used to. We were discouraged that a hike labeled "moderate" -- usually our speed -- was too challenging. And once you're on the trail, there's nothing you can do but tough it out. So if you're not hiking most trails, there's not a lot of difference among the parks. They're all beautiful, but I wish I had realized that they're all pretty much the same. But would I have planned a two-week trip at only one or two parks before actually seeing any of them? Definitely not. So there was a lot of driving, much of it very scenic, broken up by staying in very similar woodsy places. Touring several Ontario Provincial Parks: 3 of 5 leafs if you love road trips. 2.5 leafs if you don't. So besides driving and going on too-challenging hikes we: ate a lot (especially steak, potato chips, and frozen yogurt), drank wine and vodka, listened to a lot of music, had great talks, and read a lot. Saw the Sudbury Nickel, the Wawa Goose, and Terry Fox. Saw a coyote, many deer, ducks, geese, blue jays, sandhill cranes, rabbits, a bald eagle with something in its talons (! ), and many nice dogs. We saw a turtle crossing a highway, but there was no safe way to pull over and help it. I hope you made it, turtle. We thought we'd see petroglyphs in Lake Superior Provincial Park, but they are inaccessible unless you can climb steep cliffs. Saw crazy elaborate RV campsites where retired folks have created little manors. Saw a lot of friendly people, not one of whom wanted more than a "good morning". Saw a sky full of stars. Heard much French spoken. Saw dozens of old-fashioned roadside motels, old-fashioned diners, and almost no fast-food restaurants. Had a great breakfast in an ancient coffee shop in The Soo, the only restaurant of the trip. I wanted to see more of Sudbury and Thunder Bay, but Allan visited bookstores in both places, and loved the one in Sudbury. And, oh yeah, the mushrooms! Ever since reading The Omnivore's Dilemma I have been a bit freaked out by wild mushrooms. Mushrooms found in a store or restaurant, no problem. But mushrooms that appear after a rainfall or in damp woodsy places have creeped me out. Before reading Michael Pollan's excellent book, I didn't know that fungi's networks of (mostly invisible) mycelium can extend vast distances, or that visible mushrooms are but a small fraction of the whole fungus, or that mushrooms aren't plants! I was amazed to learn that fungi are a separate category (kingdom) of living things, neither animal nor plant. (If I learned this in grade school, I had long since forgotten it.) This is only a bit of what I learned about mushrooms from that book, and all of it gave me the creeps. Now I can report that this trip desensitized my fungiphobia. On our hikes we saw a great variety of wild mushrooms, and we photographed every variety we saw. Now I'm more amazed than freaked out -- although they are still super creepy! I'm going to look up the varieties online; photos to follow. Update: photos from the trip are here on Flickr. We're going glamping! Allan, Diego, and I are hitting the road. Plus quick visits to Sudbury, Sault Ste. Marie, and Thunder Bay. Hike, grill, explore. Watch dogs play on beaches. Read. Keep an eye on the Red Sox. Find used bookstores. Maybe hear some music. Take photographs. Be in woods. Feel nature do its magic. I love road trips and am in vacation mode the moment we get in the vehicle. 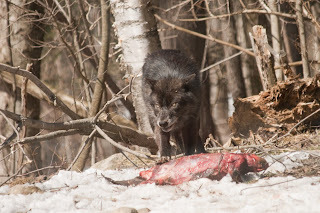 When we visited the Haliburton Wolf Centre in March - our second time there, to see the wolves in their winter coats - the alpha female was pregnant. 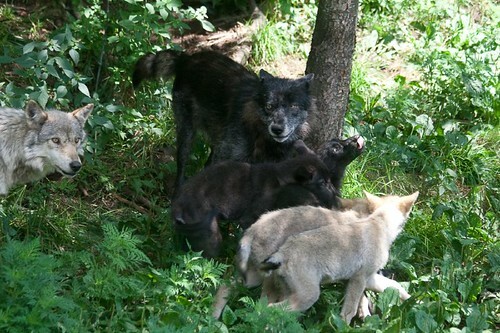 In April, four healthy pups were born: two males (one black, one gray) and two females (one black, one gray). 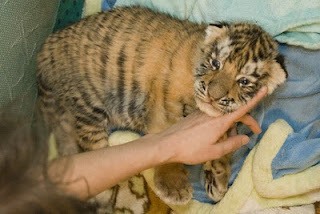 By June they were out of the den and coming into public view. 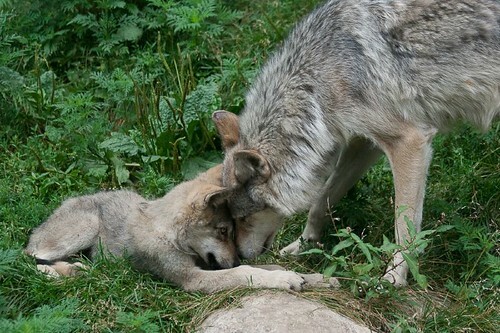 My wolf-loving friend J and I went to see them in July. 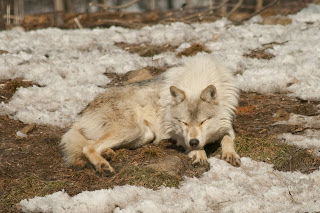 Once again, we were patient, waiting through many waves of visitors as the wolves relaxed in the sun. And once again we were rewarded. 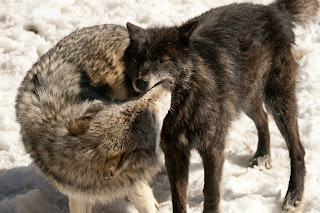 In the winter, we saw the wolves being fed; this time we saw the adult alpha pair join the pups, the whole pack nuzzling, vocalizing and playing. All these photos are by J.
I usually post only a sample of photos, but this time I've posted the whole lot: Flickr set here (all photos by J). 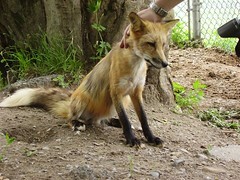 First visit to Haliburton Wolf Centre, July 2009, some photos here. 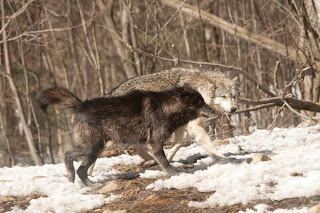 Haliburton wolves in winter, March 2011. 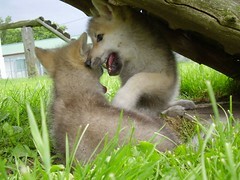 Wolf pups at Jungle Cat World, more photos here. Jungle Cat World wolves a few months later. 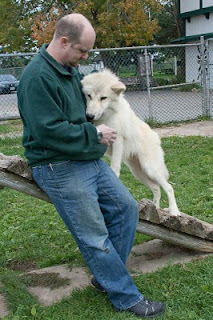 In the summer of 2009, Allan and I and two friends went to the Haliburton Forest Reserve Wolf Centre; my post about it is here and a small sample of photos from that day are here. 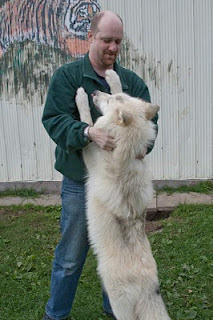 We all love animals, but J is extremely knowledgeable about animals and shares my fascination with wild canines. 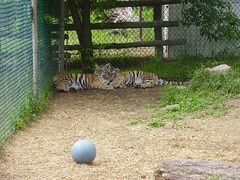 (These are the same friends with whom we've visited Jungle Cat World more than once.) 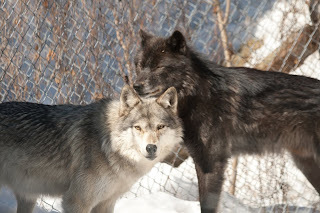 Driving back from Haliburton that day, we vowed to return in winter, when the wolves are more active and sporting their gorgeous winter coats. Last year we were all set to go, when we discovered that the Wolf Centre is only open on weekends through the winter, when I'm working. Well, this winter I couldn't stand it anymore, and used a vacation day. Allan and C couldn't make it, but J, CB and I had a great day - driving and talking, and marvelling at the wolves. There are only four wolves now. 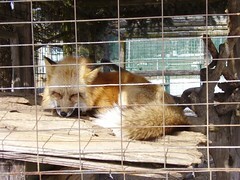 Smudge, the old alpha male we saw in 2009, has died. 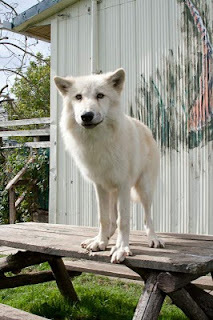 Citka, the former alpha female, died carrying a litter of pups. 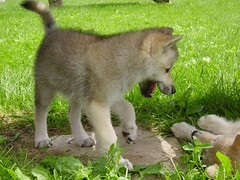 Now Granite is the only female in the pack, and the alpha female by default. 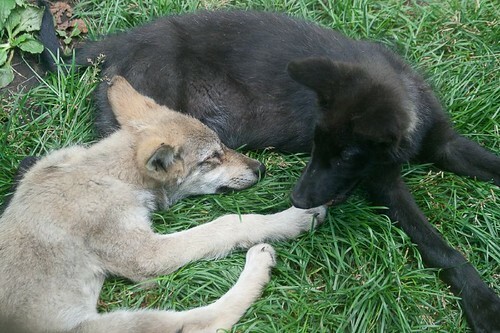 Cedar and Haida are the alpha and beta males, and Grisham (who I thought was named Grissom, until I saw the name on the website) is the omega. The best news is that Granite is now pregnant. The pups are expected in April, so yet again, we came home promising to return. 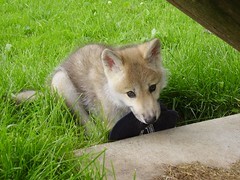 We will be watching the Wolf Centre website closely. If all goes well and healthy pups are born, we'll return in June to see them. Our visit in late March was amazing! 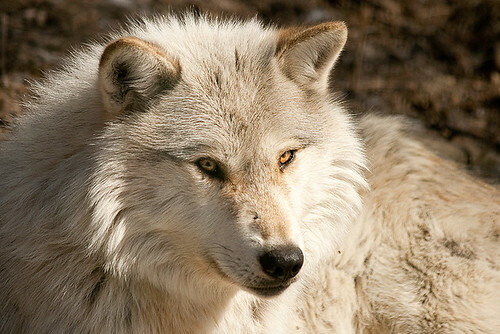 The wolves were spectacular in their thick, full coats, but what we were most hoping for was to see them fed. 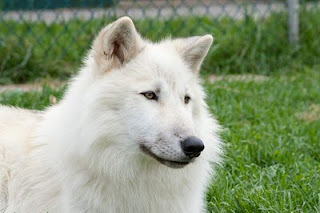 The wolves are fed only every 7 or 8 days, to more closely mimic their diet in the wild, and at irregular intervals, so they don't anticipate feeding time the way domestic and zoo animals do. 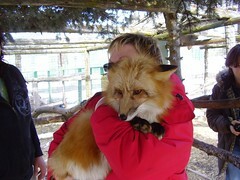 (The irregular schedule is also so visitors don't anticipate feeding time and mob the centre on those days.) So if you visit, feeding time may or may not fall on a day when you're there. J and I were so hoping to see it... and we did! Here's some of our day, with photos by J. CB had her video camera, so I hope to post a clip, and you'll be able to hear the wolves vocalizing. 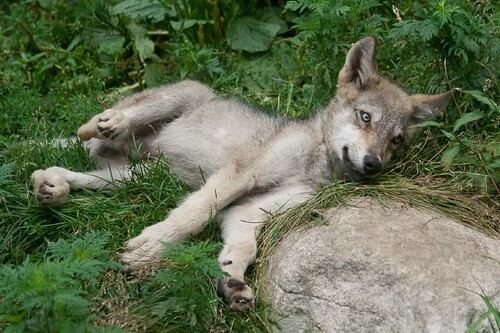 When we arrived, the four wolves were lounging in the viewing area, enjoying a lazy morning in the sun. Every once in a while, one would get up, stretch, yawn, and find a different spot. 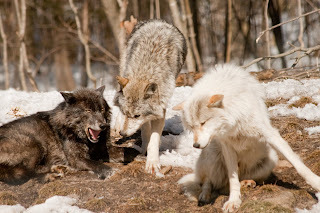 As soon as one got up, the others would follow, so there'd be a kind of slow-moving musical-chairs as the wolves changed positions. The Centre guide pointed out how the female was walking gingerly on the snow, careful not to slip because of the pups growing inside her. He said that in a few weeks she would start to show thickening around the middle. 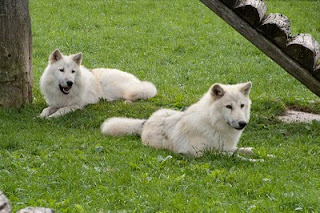 We watched this for a while, took a walk through the Centre's little exhibit space, then patiently sat and watched the wolves some more. When we first arrived, we were the only visitors there, but during the day several groups came in. (Once we had to retreat to an unheated viewing corridor, to escape obnoxious snarky comments.) 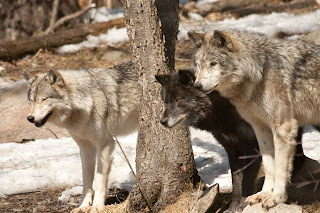 Every time cars would pull up or when the Centre door opened, the wolves would become more active - playing a little, prancing around, nuzzling each other, vocalizing - then eventually settling down. As the day went on, these spurts of activity lasted longer and longer. 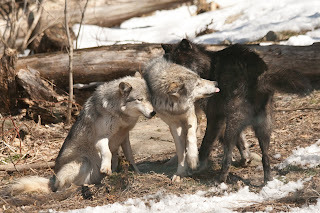 Each time, the wolves would get a little more active and noisier, and take longer to settle down. We started thinking that they sensed they were going to be fed. It was really interesting to watch Grisham, the omega wolf, during these times. The other three would squeeze their snouts together and prance around. Grisham would keep his distance, paw at the snow, get a little frisky - but always by himself. At one point, Granite climbed a little further up the slope, lay down on a big boulder from which she could survey the whole area, and waited. 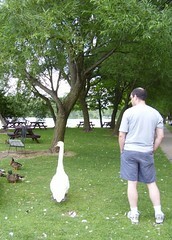 The rest kept prancing around. The vocalizing got really noisy! (There are microphones on the outside of the building.) 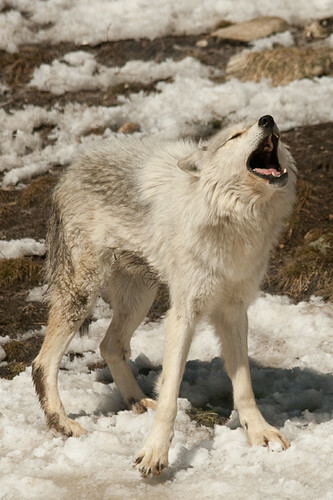 They weren't howling; it was more like sustained whining, a chorus of all different pitches. 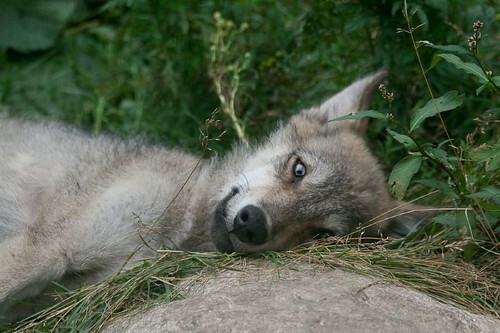 Sometimes the whining would almost become a howl, but not quite. It was a sound you'd never hear in any other context - something altogether wild. 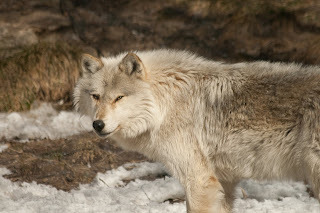 The activity kept increasing - the wolves growing noisier and more active - and then all movement stopped. 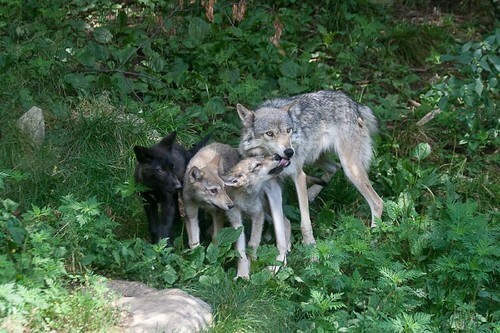 All four wolves stood still, staring, completely focused on the building's basement windows. The Centre has two-way glass - so you can see out, and the wolves see a reflection of the woods. 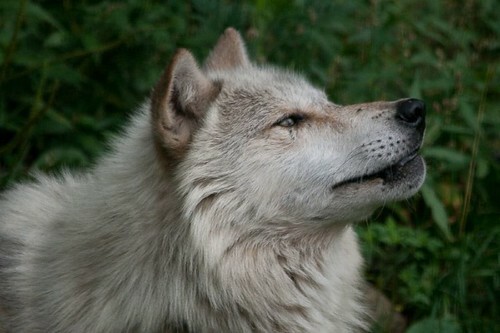 But when the light changes inside, the reflection decreases, and the wolves are very sensitive to it. They obviously know that a certain pattern of movement in the basement means food is on the way. Two men - the guide we had been talking to and one other - entered the enclosure, each holding one huge, red hunk, roughly cylindrical. We already knew these were beaver carcasses, caught by trappers, stripped, and sold to the Centre, where they are kept frozen. Beavers make up 75% of the wolves' diet. 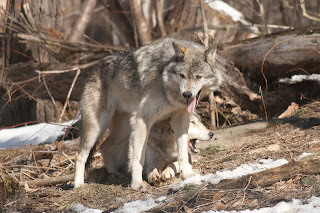 It was fascinating to see how the wolves reacted to the men in their enclosure. 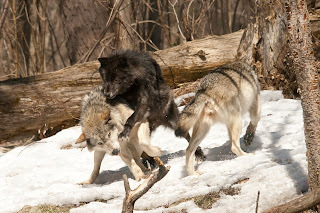 The wolves left a buffer zone between themselves and the men; when the men took a step forward, the wolves stepped back. 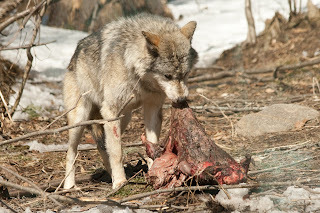 One man dropped a carcass and went back inside for another, and even with the food on the ground, the wolves would not approach and eat, as long as the human was standing near it. 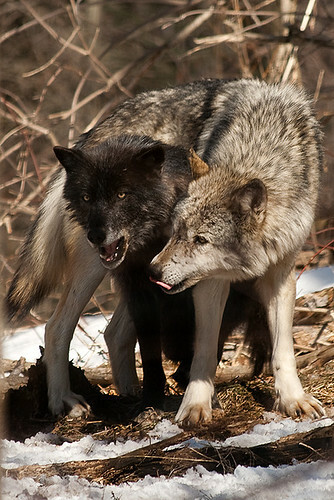 The alpha and beta wolves would stand a few feet back from the men, while Grisham trotted back and forth, even further away. The men secured two carcasses with wire to some tree stumps. When Granite trotted off with a big hunk of beaver, we understood why. 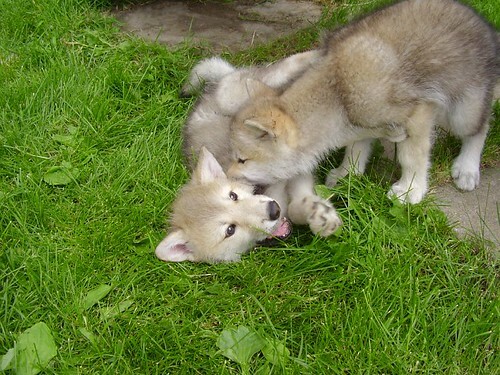 Without that, visitors would see the wolves eat for about 30 seconds! 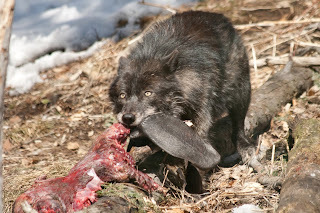 We watched three of the wolves tear into the meat, gulping it down, faces and forelegs getting bloody, loud munching and gulping noises coming over the mics. 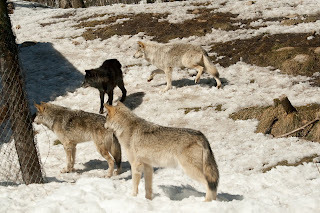 Grisham trotted back and forth, not approaching any of the carcasses while other wolves were busy with them. After some time, Granite disappeared with her prize, Haida trotted off with a tail - they love the tail! They walk around with it sticking out of their mouths, very amusing - and Ginger was occupied with a large bone. Only then could Grisham eat. Almost as soon as the beaver carcasses appeared, ravens swooped into the enclosure, waiting impatiently on branches for their moment. They looked exactly like crows, but way larger. The guide told us that ravens are the wolves of the bird world, the top of the food chain. They will chase away any other bird, even gang up on a hawk, picking at its tail feathers until it gives up and flies off. 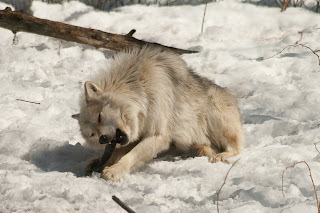 Later, when the wolves are asleep, raccoons, mice and other small animals will tunnel under or climb over the enclosure fence to pick the bones clean. 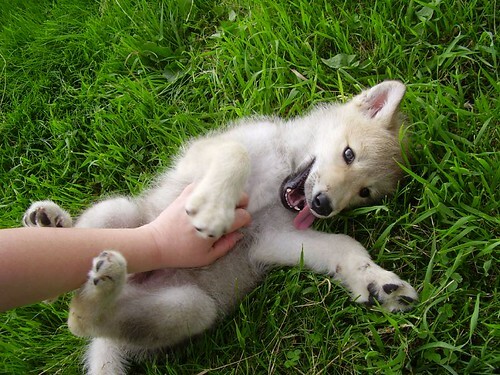 With any luck, my next Wolf Centre post will include puppies! For those uber-organized people who (like me) are already thinking ahead to 2011, or who (unlike me) have a list of holiday gifts to buy, I have a recommendation. 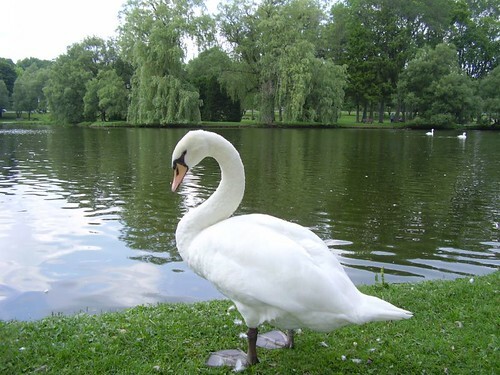 The good folks at Across the Bridge B&B of Stratford, Ontario, have created a beautiful calendar showcasing their town's famous swans. Eric and Kelly are originally from the US, now Ontarians running one of the many family businesses that live around the Stratford Shakespeare Festival. I'm totally biased towards this calendar: I love Shakespeare, Stratford, Across the Bridge, and the swans, and Eric and Kelly are our friends. But even without that list, it's a lovely gift idea that helps support a local, family-run business in a beautiful part of Canada. You can see the photos and order a calendar here on their website. Do you remember these guys? 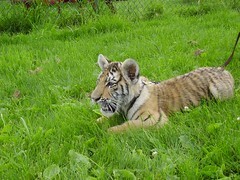 This was in Jungle Cat World in June, only four months ago. Look at them now! We weren't there, but we sure wish we had been! 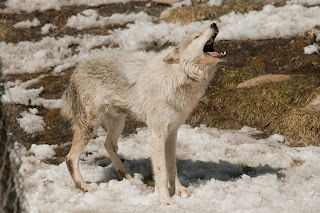 In the US, despite the court ruling re-listing the gray wolf as an Endangered Species, wolves are still in grave danger. 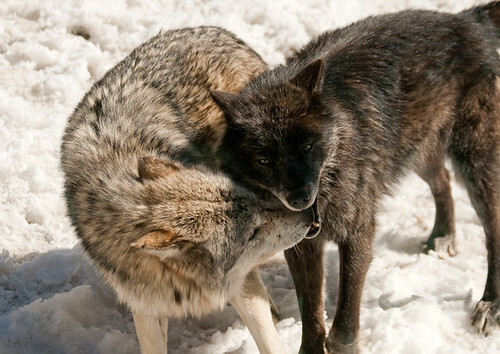 At least four states are attempting to pass laws that make an end-run around the Act and single out the wolf for extermination. 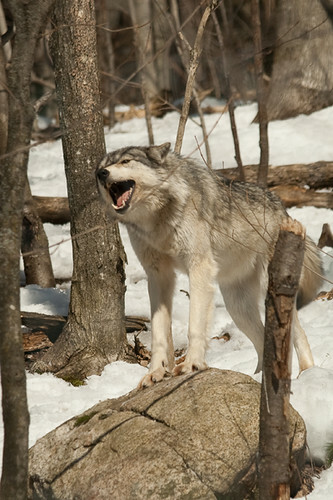 Read about it here: "New wolf bills: bad science, bad policy, and bad legislation". Yesterday my mom and I drove to St. Jacobs, Ontario, a Mennonite community in the Kitchener-Waterloo area. It's a tiny little village, dolled up for tourist shopping and spending. I've been told by many people that it's a great place to see craft work, especially glass and quilts. Turns out that's overstating it quite a bit. There are two glass studios in town, and two quilt shops, and a small room called a Quilting Museum - and that's it. 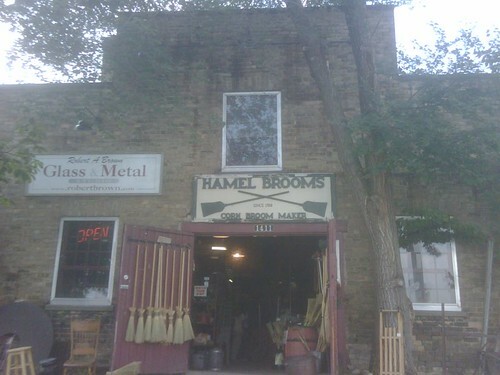 There's also an old mill that's been converted into shops. The shops are mostly independently owned and feature handmade work, so that was nice, too. In a converted barn - photo above, taken with my cell phone, so poor quality - we watched two men making brooms with hardwood handles and corn-stalk bristles, using heavy iron machinery that they worked with both hands and foot pedals. It was really interesting. In the back of the barn, an artist was making Tiffany-style lampshades and leaded glass panels. In between was a jumble of antique glass bottles, tins, sleigh bells and all manner of ye olde junque. At a quilt shop, we saw some masterpiece quilts made entirely by hand by Mennonite women. They were really knockouts. The quilts retail for around $1,000 and I can only hope the artist is seeing a decent portion of that. My mom and I enjoyed chatting with some of the craftspeople about their work. People are incredibly friendly, as they are often are in small towns, but in small-town Canada people seem so genuinely warm and open. 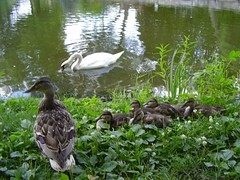 At the same time, people are reserved and polite, in the sense that they are not intrusive. It's such a sweet combination - and I find it makes me friendlier. St. Jacobs is also known for a huge farmer's market, but it wasn't open yesterday and we weren't up for that anyway, and outlet shopping, which we avoid at all costs. We also saw several horse-and-buggies on the road. There are several Mennonite churches in the area and it seems a fair number of people live in the old Mennonite tradition. They're an austere bunch, and very conservative - but they don't make war, and in that sense they are among our finest people. From there we took a pretty drive through cornfields and past small farms to the town of Elora. This is also a tiny town, catering to a more upscale crowd than St. Jacobs. The town was completely dead - many shops closed and almost no one on the street. I think it's the late-summer doldrums, and things are a bit more active in autumn. We sat a bit in outdoor cafe, stopped in a glass studio and a few antique stores, took a quick look at the gorge - which Allan and I visited some time back with the dogs - and had dinner at a pub before heading back through the farmland to the 401. It was especially nice to see the town's library, a beautiful old brick building situated prominently on the main street. The libraries in this area are part of a regional system, so the town's small building is really a branch of a much larger system, giving residents access to so many more resources. This is exactly the kind of place I can envision myself working. My mom comes in today for her annual visit, staying until Friday morning. I would have ordered last week's weather - cool, dry and autumnal - rather than this week's heat and oppressive humidity, but no one had the courtesy to ask. I hope the heat won't be prohibitive, as we have a much better time if we are out doing things. This year the plan is Mississauga and St. Jacobs. There are a few cultural and historical things to do in Mississauga - which proves that there's culture everywhere - and I thought we might drive around and do them all in one day, plus maybe a park or a lakeshore stroll. St. Jacobs is not for the outlet stores or the cutesy factor, but for quilts and glassware. My mom loves handwork of all kinds, especially glass, and St. Jacobs has a quilt museum and several glass studios. (Last year we went to the Textile Museum of Canada; we both loved it.) We'll probably hang out in St. Jacobs, or perhaps in nearby Elora, for dinner and miss the traffic on the 401. Tonight I'm making a special dinner, which is very easy to do for my mother. She's the world's least critical guest. Perhaps my mom developed her attitude of absolutely loving everything! to balance out my other parent's chronic complaining and criticizing. But he's long gone, and we're left with my mom's happy, open spirit and her constant enjoyment of life. I'm very lucky that way. We had a nice, relaxing trip to Stratford, maybe less exciting than last year, but only because my first time was a revelation, and this year I knew what to expect. Stratford is a lovely little tourist town, and I highly recommend the Across the Bridge B&B owned by our friends Eric and Kelly. It's a beautiful old renovated house in a great location; you can leave your car at their place and walk everywhere. But the real reason to stay there is Eric's incredible breakfasts, which will keep you going til dinnertime. Besides theatre, none of our other plans worked out. We didn't meet our friends for dinner and didn't go to St. Jacobs. But we hung out with Eric and Kelly, walked along the Avon River and took photos of birds, browsed in bookstores and generally decompressed. Neither of us particularly liked the production of As You Like It, but The Tempest was excellent, a real treat. The productions couldn't be more different. AYLI was crammed full of gimmicks, most of which struck me as superfluous, a bunch of meaningless clutter. The Tempest was spare and stripped down, highlighted by a few brilliant costumes - most notably for Ariel and Caliban - and a handful of light and sound effects that, because they weren't overused, were very effective. AYLI, unfortunately, featured performances that weren't up to the high standards of a world-class Shakespeare festival; I wondered if the busy production values were supposed to compensate for that. The performances in the Tempest were so good that I heard the whole play anew. Christopher Plummer was brilliant, living up to expectations, fully inhabiting the role. But the real show-stealer was Julyana Soelistyo, playing Ariel. Her performance was breathtaking. Scenes between the heavy, powerful, aging magician Prospero and the delicate, nimble spirit-servant Ariel were mesmerizing. At the breakfast table in our B&B the following morning, everyone was buzzing about Ariel. I don't want to say too much, because some of you may still catch this show. If you can, it's worth it. 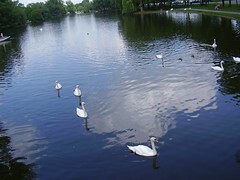 Also in Stratford, lovely swans and some baby ducks. 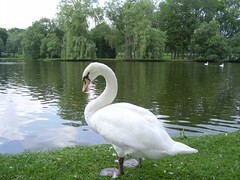 Today we are off to Stratford, Ontario for two Shakespeare productions and two nights in a bed-and-breakfast. We did this last year during the baseball All Star break, and I liked it so much, I thought it should be an annual tradition. We're staying at Across The Bridge B&B, owned by two great US ex-pats. Last year they contacted me through this blog and we stayed there as their guests, amazingly enough. Now we are regular customers - and friends. I have met the best people through wmtc. In fact, before I got back into activism and met people through the War Resisters Support Campaign and the peace movement, everyone I knew in Canada, I had met through this blog. So while I might write more about wmtc's persistent trolls, the real payoff from wmtc has been an amazing network of friends. We've met great friends through Allan's blog, too, and there's a small subset of folks who read both, or at least read Joy of Sox and are not strangers to wmtc. One of those is a Canadian Red Sox fan living in the Kitchener-Waterloo area, and we're meeting him and his partner tonight for dinner in Stratford. These are the kinds of things that make me really appreciate my life. Tomorrow we may drive over to St. Jacobs, the Mennonite community outside K-W, known for its glassworks, quilting and a great farmer's market. (Also known for outlet shopping, but we will avoid that.) I've actually been planning on going to St. Jacobs on one of my mother's visits, as she's mad for handcrafts of all kinds, especially glass and textiles. This might be a preview, then I'll do more in-depth exploring with my mom later in the summer. Tonight we're seeing As You Like It, and tomorrow night, Christopher Plummer in The Tempest. This is my theatre fix for the year! Plus a break from political and social concerns, which I could really use right now.